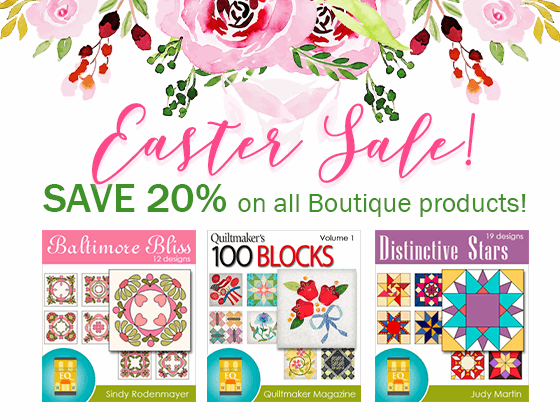 Happy Easter - Save 20% on All Boutique Products! Ends Apr 21 at 11:59pm EST. Offer applies to Boutique products at ElectricQuilt.com. Use code HAPPYEASTER at checkout. Sale ends Sunday, April 21, 2019 at 11:59pm ET. EQ7 Summer Drawing Series: Block 1 Link Up! I hope this drawing lesson has given you the confidence to try drawing some of your own blocks on the EasyDraw Worktable. In case you missed it, check out the mini lesson for drawing a few variations of Block 1. Scroll down to the comment form at the end of this post. Fill in your info and make sure you select an image for your comment (this will be the photo of your block). If you have a blog, make sure to add your site too. If you wrote a post for this block, please link directly to that post. Let’s visit each others’ blogs and all get to know each other! You can link up your Block 1 photo at any time. But for those who link up by Wednesday, June 5, 2013, 9 am EST, you’ll be entered in a little giveaway! One lucky winner will receive a priority mail envelope filled with fabric scraps. Because who doesn’t need a little more fabric?! Come back on June 1 (tomorrow!) for the Block 2 lesson! So, here is my block. Looking forward to seeing all the blocks! It’s a great way to learn more about EQ7 Thanks sew very much for showing us how to play with it this summer. Here is my block #1. Thank you so much for doing this! I am learning a lot. I made all four blocks … there’s always a need for Charity quilts. I’m looking forward to lesson #2. Indeed! I’m turning each block into a preemie quilt. Putting the binding on the first one today. Had fun learning. Looking forward to block #2. This has also helped me to get back into my sewing/quilting. I had so much fun. This is the first time I designed a block and then put it to fabric. Thanks for the lesson! Enjoyed this and looking forward to the next. Here’s my Block 1. I’m traveling through California currently in our RV. As there is not much space to spread out, I thought a Block at a time was just right! I’m looking forward to learning more techniques in EQ. Fantastic way to learn the program. Thanks so much. I bought some sunflower fabric when I was in Kansas City, a couple of summer’s ago. Just enough for this 4 block wall hanging. I usually work with much smaller blocks, so the 12″ was gigantic! Nancy Sayward, I love your block. The colors look wonderful together. How nice all these blocks look, I can hardly wait to see the next set of directions to play with Yippe!!!!! This block is going to go into a quilt for my granddaughter. I am using my extra material from my other granddaughter’s quilt. The quilts will be different but with the same material. Had a really good time making this first block and looking forward to the next one. What fun to visit blogs and see everyone’s blocks too! All these blocks look wonderful! Great job everyone! Here is my original block from Lesson 1 and variations completed in the mini lesson. Thank you for the great lesson. Here is my block. It was fun, although I had a little trouble putting it together. I’m not used to working with such small pieces! Wow! I’m impressed with everyone’s block! Here’s mine. I am an art quilter so this is new to me piecing. Since I made it over Memorial week end it is in honor of my father, retired Atmy and my husband and son both retired Navy. I am an art quilter so this is new to me piecing. Since I made it over Memorial week end it is in honor of my father, retired Army and my husband and son both retired Navy. This was fun! I’m looking forward to the next one. I will be doing all my blocks is black and whites and colors. Sorry, I haven’t figured out how to crop the picture to send it. Maybe this will show you enough to do it. Good luck! You can always go back and do the mini lesson later. You’ll find all the EQ7 Summer Drawing posts from the main menu (under Behind the Mouse). Hover your mouse over Sew Alongs and then click EQ7 Summer Drawing from the drop-down menu. These block link ups will remain open too, so if you sew one of the mini lesson blocks you can post it here too. The blocks look great and this is fun. Thank you for your tuition – really enjoyed doing this block. Thanks! I learned quite a lot from this first lesson. Thank you for these block drawing lessons. I really enjoyed Lesson 1 and the mini lesson. Learning to draw my own blocks has been on my wish list for awhile and the lessons motivate me to at least do the designs in EQ. Now if I could find the time to actually make the blocks that would be great. I did the computer work to draw and colour the three variations, but I only had time to make the original. Loved working on this block. I got to use my scrap bag and to fussy cut some of the squares. Had as much fun using crazy fabric from my stash as in being reminded of the manners of block drawing. Look forward to the next block. I used red/white & blue scraps and loved how it turned out! Here’s the first block. Love the lessons and stitching it out. Feel so creative. Piecing not my strong suit, but working on it. Having fun. And ready for the next lesson. This is a great way to learn EQ7. I hope you continue with a Fall Drawing Series. I thought I’d experiment with all solid colors so here is Block 1. I had so much fun and i’m looking forward to the next one!! I love seeing so many familiar names from the BlockBase Sew Along! It’s so fun to see how fabric choices can change the look of a block. This was fun! I’m including it in a random sampler quilt I’m making with Anita at Bloomin Workshop. Sorry I posted my photo in a very small format and could not repost it because the site would not let me. Made from scraps I have had since the 80′s. Here is one version of block 1 used as a placemat. I am enjoying drawing and learning from this. My “digi group” of five women meets once a month and learn these blocks together after lunch “out”. Jenny – great to meet you at the International Quilt Festival in Chicago! I am really enjoying your lessons in drawing. I am adding these blocks to my local block of the month class blocks for my first large quilt. Did I miss the classes? Link up! Show us your Block or just leave a comment! What is 9 + 6? How do I submit an image of my Block? On the Block Worktable, click the PRINT & EXPORT tab. We recommend setting the Resolution setting to 150. Outline patches is optional. In the comment form below, tell us a little bit about your design and then click Browse to include the image of your block. Select your block, then click Submit Comment.